Although our military tailoring is now outweighed by our civilian wear we still undertake a fair amount of work making and mending uniforms. Take this striking Queen's Royal Hussars jacket below which came in recently to be re-ranked. The Queen's Royal Hussars is the most senior armoured regiment in the UK. The regiment, in its current form was established in 1993, when the Queen’s Own Hussars and the Queen’s Royal Irish Hussars were brought together into a single unit. The original regiment, on this historical timeline, was the 3rd The King's Own Hussars cavalry regiment formed in 1685 who, in 1958, became the Queen's Own Hussars. What stands out immediately is the chainmail on the shoulders This symbolises the regiment's calvary past when full chainmail was worn, particularly on the shoulders, to protect the sword-bearing arm. Over time the chainmail reduced as weaponry evolved. Nowadays, the regiment use Challenger 2 tanks instead of swords & horses but the chainmail remains as a firm nod to their proud past. When regiments are brought together discussion takes place, behind closed doors, on what elements of the original regiment's symbols remain. 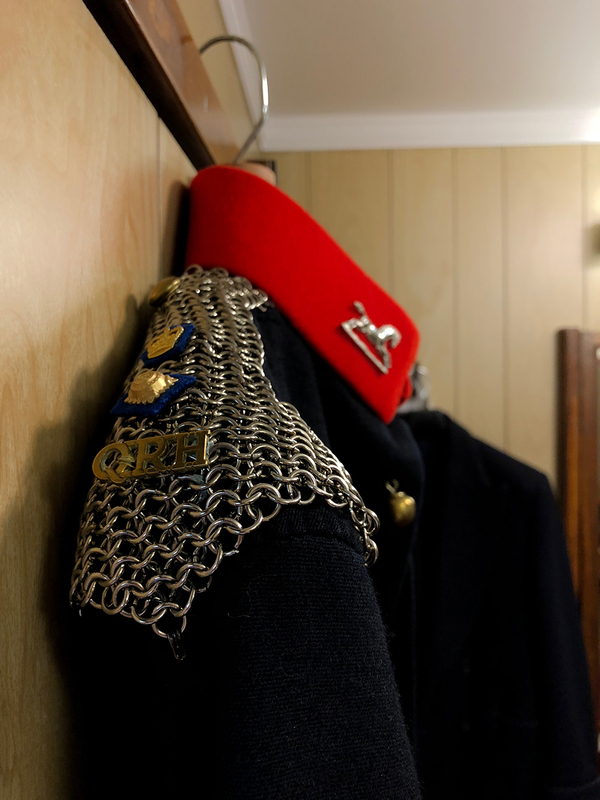 What we see today on The Queen's Royal Hussars uniform is a combination of those past regiments. For example, the badge includes the harp of the Queen’s Royal Irish Hussars; the regimental cyphers 7th Queen's Own Hussars and the drum horse from the Queen's Own Hussars. These historical elements are also seen across the uniform itself. The round buttons have a very interesting history. They were, in fact, backup ammunition for the soldier's muskets should they run out. In battle, the buttons would be ripped off, loaded and fired. For more information on the Queen's Royal Hussars please visit the Royal Army website.